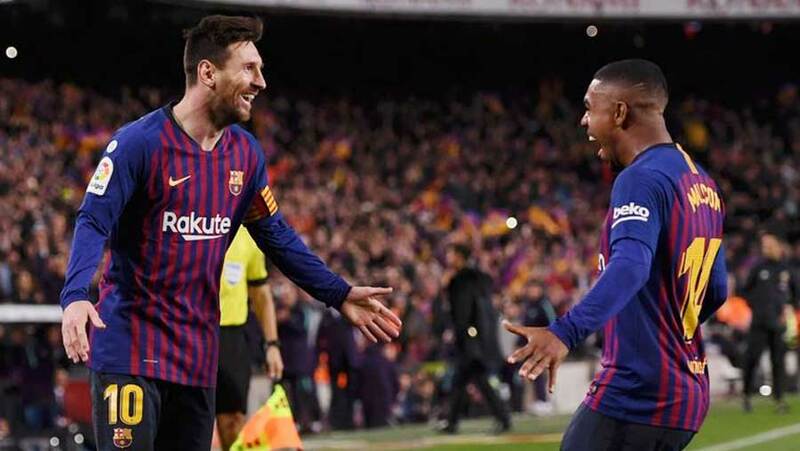 A late double from Barcelona was enough to earn them a crucial 2-0 win over title rivals Atletico Madrid at the Nou Camp on Saturday (Apr 6), taking them to within touching distance of retaining the league title. F.C. Barcelona moved 11 points clear at the top of La Liga after two late goals ended the stubborn resistance of Atletico Madrid, who had Diego Costa sent off in the first half. Luis Suarez and Lionel Messi scored superb goals to leave Barca huge favourites to win a fifth title in seven years. Former Chelsea striker Costa was shown a straight red card for abusing referee Jesus Gil Manzano in the 27th minute. And Suarez and Messi made Atletico pay. For most of the game, it looked like Atletico goalkeeper Jan Oblak would be the hero to counteract Costa's villainy, making a string of superb saves to keep Barca out. But with five minutes remaining, former Liverpool striker Suarez bent in a low shot from 25 yards that beat the Slovenian keeper and flicked in off the base of the post. Diego Simeone's side were once again superbly organised, and had to be after Costa's latest moment of ill discipline. Apparently angered by Manzano's decision not to play an advantage, the Spain international confronted the referee and was shown a straight red card. Jordi Alba had already hit the post after a glorious pass from Messi, and Oblak kept out Philippe Coutinho, Messi and substitute Malcom in another fine display. He eventually made eight saves. Atleti's one good chance came as Rodrigo headed a free-kick over with 15 minutes left. But Suarez and Messi then struck to leave Simeone's side seemingly in a race with city rivals Real for second place. Messi has now won more La Liga games than anyone in history - moving ahead of former Real keeper Iker Casillas on to 335 victories.